A wind stopped. 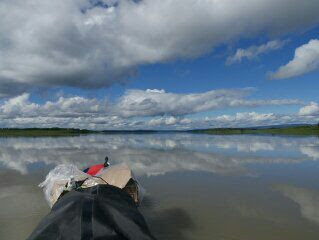 Although a water of the Yukon River was flowing, the surface of the water became a big mirror reflecting the sky. The another world changed into the another world further. The world, where only the sky and a water was there, changed the world, where only the sky was there. After joining the Tanana River, the river has changed again. The quantity of water has increased, and the river width has become close to a mile. The great river has changed into the great river further. People of the village had given me moose and salmon. To avoid to spoil, I have to eat hurry. Tonight I ate only salmon, and then tomorrow morning I will eat only the rest of salmon. As for moose, tomorrow night I will eat only it. Three of person had given me foods with a word "Good luck".